What are you going to do after graduation? 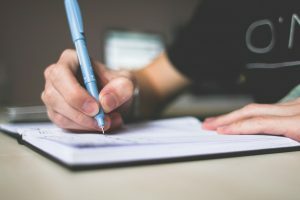 Are you getting enough experience in school? Are you meeting the right people to jump into public relations? What are you doing now? Ah, college students experience a waterfall of stress during the holiday season. Family members vocalize the worries already gnawing away at soon-to-be grads. Looking ahead to winter and spring terms, one of the best ways to address those concerns is to get relevant experiences while still taking classes. Whether it’s a part-time internship at a local nonprofit or a more time-intensive role through the university, professional work can flesh out portfolios and give students a leg up when applying for full-time positions. The following are some best practices for students when considering an internship during the academic year. While taking on a career-relevant position and classes simultaneously has its benefits, it can also be tough finding the right fit. Understanding your personal bandwidth, asking the right people for help and identifying the most valuable opportunities are key to having a positive internship experience during the academic year. 1. Figure out what you can realistically manage. “Having an internship feels like having a real-world job in PR,” says UO Public Relations senior Abbey Tozer, who is currently doing a crisis communications internship at Lane County Health and Human Services in Eugene. “That said, I have to remind myself that my top priority is still my academics, so finding that equilibrium has proven to be challenging at times.” Some part-time internships require 10-12 hours a week. Others, however, can be more demanding. The first step in the search process is to outline your own time and geographic constraints during the school year. It can be a good idea to plan your schedule with large gaps between classes or even entire days free that can be dedicated to work. If transportation is an issue, see if working remotely is an option. Social media roles are one of the most common types of remote internships. 2. Talk to your advisor. The SOJC advising team provides both academic and professional guidance. Whether it’s helping you figure out what internships would best complement your current course load or letting you know about great opportunities within the SOJC, they can help make the internship dream become a reality. 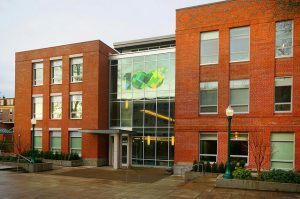 If neither drop-in hours nor available appointments work for you, or you’d simply like a second opinion, the UO Career Center is an advising option outside of Allen Hall. The Career Center team offers individual advising as well as classes and workshops on gaining real world professional experience. 3. Peruse available databases. 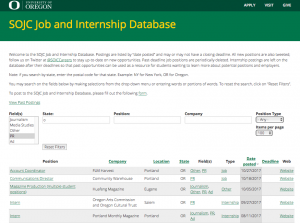 The SOJC Jobs and Internships database is constantly being updated and features open positions all over the country. On average, it has more Oregon-based internships than other databases, such as LinkedIn, Indeed or Internships.com, which caters well to students seeking an opportunity during the academic year. The UO Career Center database also has a Pacific Northwest slant, lending well to feasible, academic year, part-time internships. Finally, many national organizations, such as the Public Relations Student Society of America, have robust internship databases that highlight open positions around the world. 4. Do informational interviews. Sitting down with a professional to chat for 45 minutes can help broaden your network. While Skype and Facetime have made it easier to connect with people outside of your immediate area, nothing compares to meeting with a professional face to face. In addition to having a more natural conversation vis-á-vis, meeting with relevant professionals in Eugene means meeting with individuals for whom you could realistically intern during the academic year. Read more about the general benefits of informational interviews here. 5. Talk to upperclass(wo)men. Turnover with internships in a college town is high. Students come. Students graduate. Get to know your peers currently working as brand ambassadors, social media managers or in other part-time, internship positions. 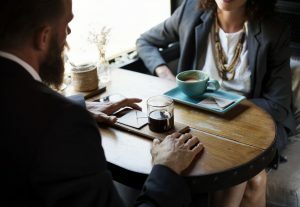 If you’re interested in the tasks they get to do and the company for which they work, that relationship can be a good way to get your foot in the door. This is particularly true if they are two or three years ahead of you in school. Relationships are everything in public relations! Have you had an internship while also taking classes? Tell us what worked, what you wish had gone differently or any advice you’d have for others pursuing an internship during the academic year on our Twitter, @SOJCPR.